The success of an online store depends on many factors. However, the potential buyer first of all pays attention to the appearance of the store's website. In this article, we will talk about what is best to avoid, and what needs to be paid more attention, especially in terms of the selection of colors and color scheme. When creating an online store, you must select the primary color. It should stimulate a person to stay on the website, pay attention to the product and buy it. Usually, future businessmen follow a simple rule: "I like this color, it means it will suit". This does not always work. Black is the color of confidence and stability. Its use is appropriate, but in a moderate amount. Do not get carried away with black, because its excess creates a dark atmosphere. White is lightness. It is used in design most of all, especially in order to highlight some elements. This color improves perception. Red means bright emotions, passion. With this color you need to behave very carefully. It is known that red color can have the opposite effect. Rarely you will see the abundance of red in successful online stores. Blue is productivity and peace. This color prevails on the websites of popular online stores. It is considered one of the most used colors in the Internet. Green is naturalness. This color is perceived by people very easily. It is usually used in that kinds of stores that sell natural products or cosmetics. Yellow means fun, playful. It is a very attractive color, but some of its shades can be irritating. It all depends on the combination of yellow and other primary colors. Purple is the color of luxury, wealth and power. It is often used in online stores that are targeted at the elite segment of the market. The next step is the selection of the color scheme. You need to choose a set of colors that will complement the main color, preferably not more than three. Remember that colors and their shades should harmoniously blend. If you have difficulties with this, then use the color wheel. 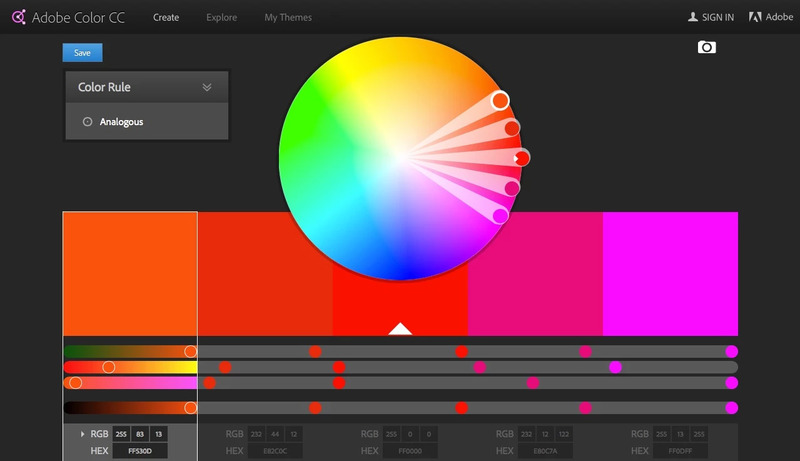 This is the main design tool for color selection. The color wheel is easy enough to use. It is in Adobe Color CC, where the selection of colors is carried out online. Use the chosen colors wisely. Forget the rule "the more, the better." Try to choose warmer shades, because they cause the buyer a pleasant association. Do not forget about the "view from the side". Show the website to friends or acquaintances. Avoid ridiculous combinations of color font and background. For example, yellow letters on a red background or black letters on a yellow background. Due to the harmoniously selected colors of the online store, you can not only increase sales, but also force the buyer to come back to you again and again.